There is a ramen shop that is up top on my ramen radar. My Ram-dar if you will. This shop appears amazing in so many ways. First up, the name. It's called ジャンクガレッジ, Junk Garage. Secondly, it is directly connected to popular Tokyo shop Rokurinsha. Thirdly, check out this signage! GARLIC. Let's put it in! But this shop is about 30km away, up in Saitama. A train ride is possible, with multiple transfers and a lot of yen spent. This calls for something more... adventurous! I hopped on the CB1000 and headed north. Actually, this shop is on the street I live on. A straight shot. On the traffic clogged streets of Saitama. It took over an hour each way. But for sure it will be worth it. The anticipation is huge! Closed. On Tuesdays. It's Tuesday by the way. 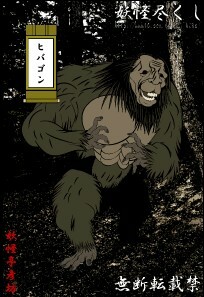 The Japanese version of a Yeti, he was first seen in Hiroshima in the 70s. I can't assume much about this half man half ape creature, but surely he would have a voracious appetite! This was a great find. I would never have returned to this area if my first choice had not been closed. But as soon as I saw the blended shoyu and tonkotsu broth, I knew it was fate. It's a very "rough" blend. The soup is inundated with fatty abura pieces, and the pork almost dissolves into the mix. Meaty enough for a monster, but refined enough for a man. A huge attraction here is the funky interior. Ice Cube was playing on the speakers, and the walls were covered with bits of Americana. License plates, old Coca Cola crates, and red vinyl seats scream tacky and comfortable. A lot on the menu. The "Samurai Miso Ramen" looked great. But I had to go with the "Hibagon Ramen" this time. And I had to add the "crazy" spice. Toss in a lot, it's good. After finishing the main dish, you might want to try the homemade pudding. Not busy at all, (this is Saitama!) I had some time to chat with the owner. He loves America, and he loves ramen. No problem with me there! This could be a great spot to check out if you are ever in the Omiya area. Maybe you are going to the Super Arena to see a Kiss reunion tour. Or maybe you are spending the day at the Japan Railroad Museum. Or maybe you are a big fan of bonsai (Omiya is the center of worldwide Bonsai... research). If any of these maybes applies to you, check out Moeyo Hibagon!